I want you to buy the Nvidia Shield, because I’m a selfish prick. If you buy the Nvidia Shield, perhaps developers will actually make games for it—and then I could buy one too. Why would you buy the Nvidia Shield? Well, it’s the most powerful set-top-box ever made: an Android TV box with a Tegra X1 chip that can play games as demanding as Crysis. The price? Just $200. If you’re the right person, I think you’ll get a real kick out of it. A sleek, angular, Batmobile-black set-top box running Android TV—aka the version of Android for televisions that we completely, utterly panned for being a sad sack of broken promises when it shipped last November. At least this time, Android TV has some goodies on top. For $200, the Shield comes with a premium Xbox-style gamepad, Netflix 4K movies, and the ability to stream games from Nvidia’s Grid servers or your own GeForce-equipped gaming PC. It’s also got loads of ports and the external storage that Google’s Nexus Player lacked. There’s a curated store where—Nvidia swears—there will be loads of amazing new Android games. Nvidia’s even tweaked the software to play nicer with your home entertainment system. But is it lipstick on a pig? Ever since the original Shield handheld game system, Nvidia’s been betting big bucks that Android will be the next great gaming platform. And maybe, just maybe, the company has finally convinced some game developers that it might be true. Surprisingly big games like Resident Evil 5, Borderlands: The Pre-Sequel, and Metal Gear Rising: Revengance are now coming to Android because of Nvidia’s muscle. With a little extra help from Google and Android developers to make games playable on the TV, we might be able to have a viable Android game console in the living room. I don’t know where a silicon chip manufacturer got a design team, but damn can Nvidia build a sleek-looking product. The Shield Android TV is as angular as a stealth fighter, clearly inspired by the classic F-117A Nighthawk. It’s a little small for a home theater cabinet, but it looks just fine underneath my TV set, and it definitely stands out compared to the hockey puck designs of other miniature set-tops. And compared to those other mini set-tops, it’s also loaded with ports. There’s HDMI 2.0 with HDCP 2.2 for 4K 60fps video, Gigabit Ethernet for worry-free streaming, two USB ports for external drives, peripherals, and USB headsets, and a microSD slot for expanded storage, plus micro-USB. You can actually plug in Xbox 360 controllers—even an Xbox 360 USB wireless adapter—thanks to Nvidia’s copious built-in support. Or a webcam for video chats, though I haven’t tried that yet. But you won’t necessarily need that last one, because the Shield comes with an excellent controller of its own. While the $100 Nexus Player shipped with a crappy five-button remote control, the Shield comes with a truly premium gamepad with great buttons, great analog sticks, built-in volume control, a microphone for voice search, even a headset jack so you can play Doom 3 without the constant shrieks of dying demons disturbing others in the room. There’s also a more standard media remote, also with the headset jack and voice search, but it costs an extra $50. Watch our video walkthrough of the Shield and Android TV above. The promise of Android TV was all your apps, movies, music, TV shows and games on the big screen, all just a voice search away, or in a super easy-to-use Netflix-like scrolling interface that intelligently suggests what you’d like to see. The reality is a super-easy-use Netflix-like scrolling interface that doesn’t have the foggiest idea what I enjoy, with a ridiculously limited selection of apps and games for no obvious reason. The home row is where your “recommendations” lie, and it’s the first thing you’ll see every time you power up the device. Mine currently recommends a bunch of YouTube videos I don’t want to see, a game I recently deleted (wow, thanks), a random song from my Google Play Music library and a bunch of content Google Play Movies and TV that I don’t want to rent or buy. I’m logged into my Hulu Plus account, so you’d think it would recommend the latest episodes of shows I subscribe to on Hulu, like Castle or Sword Art Online. Instead, it seems to think I’d like to watch The Bachelorette and WWE Monday Night Raw. Yep, sounds about right. Similarly, though I’m logged into my YouTube account—you know, the one that’s subscribed to video game and tech news channels that I like—Android TV seems to think I want to watch a giant kangaroo move into a Brisbane suburb in Australia, or a truck board a ship using a pair of flimsy wooden planks, or maybe Howie Mandel getting hypnotized. No thanks. And as before, I can’t dismiss these suggestions, or flag them as incorrect. In fact, even if I watch them, they’ll come right back after I reboot the system. The other half of Android TV is apps, and that situation may be getting better. Right now, you still don’t get access to the vast majority of Android apps—only a tiny little curated store. But there are definitely a few more apps in the store now, and more are on the way: Google just announced CBS, Fox, Epix, WWE, UFC, USA Today, Vimeo, Vudu and Twitch are coming this summer, and Sling TV recently launched on Android TV as well. And Google promises that the curated store will give way to a larger, more browsable Android TV app experience soon. Update: That more browsable Android TV app experience is here, and it’s way better. Things are no longer arbitrarily missing. Voice search also works across apps now, so you can—just as an example!—watch Pumping Iron for free on Crackle instead of paying $3 on Google Play. Sadly, Netflix still isn’t included in voice search for whatever reason. But you didn’t come here to talk about Android TV, right? You want to know if the Shield has game. Crysis isn’t out yet, so we couldn’t put the Shield to the ultimate test. But with big PC ports like Doom 3 BFG, Trine 2, and The Talos Principle, it’s clear that the new Tegra X1 processor has some real oomph. We’re not talking PS4 or Xbox One level graphics here, or anything you’d experience with a powerful PC, but these games actually do feel preeettty close to PS3 or Xbox 360 era levels of detail. It’s pretty heartening to see. That doesn’t mean there isn’t a gotcha, though. Here’s numero uno: The 16GB Shield only has about 10GB of usable space out of the box... and these latest games can easily swallow 2 to 5GB apiece. You’ll want to add a microSD card pronto. Thankfully, those come cheap these days, and Nvidia has a handy toggle to let you install them there automatically. Just by adding an 8GB microSD card, I was able to install and play Doom 3, War Thunder, Luftraisers, Hotline Miami, Half-Life 2: Episode 1, Trine 2, Garou: Mark of the Wolves, Dead Trigger 2, Modern Combat 5, Asphalt 8, Sky Force: Anniversary, and Goat Simulator before I ran out of space. Not a bad haul. Here’s gotcha number two: Would you believe I just named almost all the high-profile games available on Android TV right now? There are three different places on the Shield you can download Android games, and each of them is a pretty poor way to browse the options on tap. Why does the Google Play Store only list Modern Combat 4, when Modern Combat 5 is right there? Why Final Fantasy III and not Final Fantasy IV, when both games have perfect controller support? Worse, Google won’t let you install some perfectly compatible games without jumping through additional hoops. Sonic the Hedgehog 2 is an amazing classic title you can play with the gamepad or even a media remote. It runs perfectly on the Shield. But Android TV flags it as incompatible. if you want to install it, you’ll have to sideload the APK... or else push it from the Google Play Store on your desktop or laptop. Update: A lot of this is fixed now that the app store experience is better. Still, no idea why there are multiple incomplete ways to get apps. Gotcha number three: if your nice big games need to download giant data files from the internet after you install them, Nvidia can’t move those to microSD. Even if you’ve got a giant SD card, you could run into a situation where the internal storage fills up and you can’t install any more big games. Google claims it’s fixing the Android TV game discovery issue, and Nvidia says it’ll find a way to move those big OBB files to microSD, but right now it feels a little hack-y. 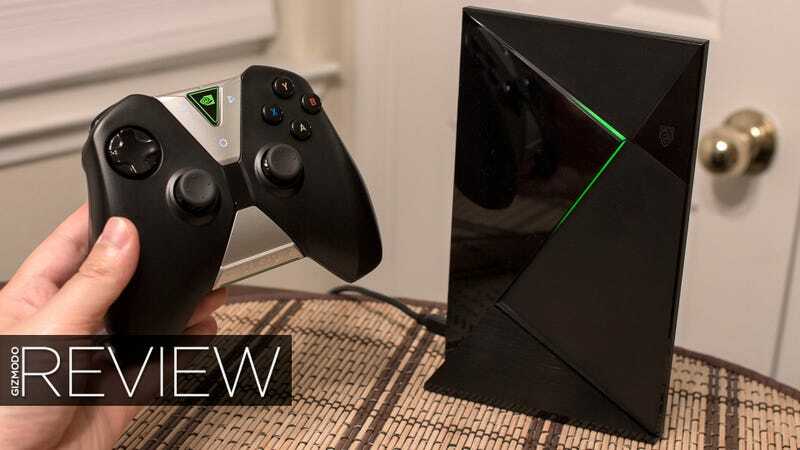 There’s a damn good reason that Nvidia stopped calling the Shield a game console and started calling it a set-top-box: Android TV still isn’t ready to be a real game platform. Thankfully, the Shield doesn’t just limit you to Android games. If you’ve got an excellent internet connection, you can stream games from Nvidia’s Grid cloud gaming service. If you’ve got a great home network and a gaming PC with a recent GeForce graphics card, you can stream games from it too. Nvidia’s been working on this technology for quite a while now... and it’s getting pretty decent! Mind you, I’ve got a pretty great internet connection at home and a pricy 802.11ac Wi-Fi router, but I’ve also been testing streaming technology like PlayStation Now, Steam In-Home Streaming, and Nvidia Grid for a while, so I’m pretty confident when I say the new Shield Android TV is among the best I’ve tried. The new box is equipped with 2x2 802.11ac Wi-Fi, and I was often able to get playable 1080p 60fps streams over wireless. Is it perfect? Definitely not. I still saw the occasional stutter, there’s still a teensy little bit of lag, and I don’t think I’d trust the technology with competitive multiplayer games or twitch reflex games like Dark Souls II. But I’m actually looking forward to streaming some more Grand Theft Auto V to my TV. It’s nice not to have to lug my computer down to the living room. Particularly because Nvidia’s added a few cool new features to the Android TV version of its streaming client to play nice from the couch: you can enable multiple controllers (I got a three-player game of Monaco started with a Shield controller and two Xbox 360 gamepads) and on-the-fly overscan correction if your streaming picture pushes past the bezels of your TV set. Need to access Steam or have a mouse and keyboard for a sec to enter in a password on a remote PC? Hold down the Start button and up pop all the virtual peripherals you need. Trust me: you’ll want to buy a large microSD card and set it up right away, before you install games. The Shield really, really doesn’t like to be out of space. I saw all kinds of crazy crashes and reboots when it ran out of internal storage. Nvidia says that will get fixed, but I can’t say when. The Shield supports a different kind of streaming, too: Twitch is built right into the system, so you can stream video of your gaming exploits to a live audience just by holding down the Back button. I haven’t tried it yet. 4K streaming looks pretty great, but not all 4K is equal. Netflix uses H.265, which seemed way crisper than YouTube 4K’s VP9 tech from across the room. Don’t expect to play games at 4K. Even some of the latest gaming PCs still struggle with that. Like other Android TV devices, the Shield doubles as a Chromecast. So you can beam anything you see on your phone to the TV, and if you enable HDMI-CEC it’ll even automatically switch your TV or receiver to the right input! The Shield supports all kinds of video codecs and home theater goodness, and it comes with Plex. There’s also a VLC app on Android TV now. You can also apparently access a hidden app for live TV channels (!) if you plug in a HDHomeRun TV tuner. I do really love Android TV’s voice search, but not for the reason you expect: I just love looking up my favorite actors and immediately finding loads of random YouTube videos featuring them. But sure, you can also search for the weather and answers to all sorts of other questions. You can get a nice metal vertical stand that melts right into the Shield’s angular design for $30. I don’t think I’d buy it, but the Shield looks pretty great as a 2001-esque monolith. For a limited time, the Shield will come with a $30 Google Play gift card and a three-month subscription to Google Play Music. So factor those into your buying decision. There’ll eventually be another $300 model with a 500GB hybrid hard drive and a copy of Borderlands thrown in. That drive will probably fix the storage woes. Do you really need a media streamer? Do you want to spend an extra $100-$150 to make sure it’s a media streamer that plays a tiny collection of Android games really, really well? (Are you sure you don’t just want to buy a more capable Xbox One or PS4 for a couple extra bills?) Are you sure you’ll stream games from Grid or a home gaming PC? Do you have a 4K TV? Do you believe Nvidia will successfully convince Google to get its act together when it comes to Android gaming? If you answered yes to all these questions, then yes. Buy it.